not those who know much, who so positively assert that this or that problem will never be solved by science. I have re-written this philosophy essay a number of times, trying to make it as short, simple and engaging as possible, while also explaining some fundamental truths about physical reality. I hope it entertains you while also making you more aware of this importance of philosophy. Of understanding the truth about our existence in the universe (physical reality) as the necessary foundations for wisdom in our thoughts and actions. I believe our future survival depends upon this. PS - I have recently written a letter to academic philosophers that anyone who enjoys philosophy will find very interesting! Summary: The central problem of philosophy is most clearly explained by David Hume, the problem of causation and necessary connection. If we don't know how the many things we commonly experience are connected together then we do not know the source of truth. At a fundamental level (physics) this problem of causal connection applies to how discrete and separate matter particles interact with one another across the universe (space and time). The solution is obvious. Don't describe an interconnected reality in terms of discrete and separate matter particles! The obvious way to describe reality is the most simple way, that only one thing, space, exists, and matter is formed from waves in space. i.e. We simplify the metaphysical foundations of physics and philosophy from the motion of matter particles in space and time, to the wave motion of space that causes matter and time. i.e. From a metaphysics of space and time to a metaphysics of space and motion. It then becomes obvious that an electron is a spherical standing wave in space. 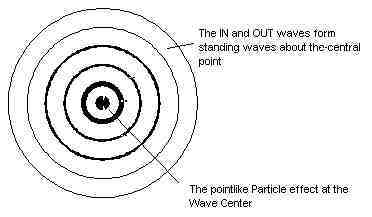 The wave center causes the particle effect, the spherical in and out waves interact with all other matter in the universe - which then solves this most profound problem of causation and necessary connexion. This really is simple and obvious - the essay below explains this, and if you find it hard to picture a spherical standing wave then have a look at the Wave Diagrams page. I realise that philosophy in our postmodern world is seen as something fanciful and vain, just a lot of 'philosophical' nonsense that is irrelevant to daily life. And as the Montaigne quote above shows, this has been the case for centuries. Yet philosophy is simply the study of truth as the necessary foundation for acting wisely. e.g. It is unwise to dive into a pool of water unless we know the truth about its depth. Likewise when we drive at night we use our headlights so that we know the truth about where the road leads. The point is obvious - that knowing the truth about things is central to acting wisely and preventing harm - and this applies to everything we do on a daily basis. Given this importance of knowing the truth you would expect that philosophy is the most important subject for humanity to understand - yet clearly this is not the case. Why? Because over the past 2,500 years since philosophy was first formalised no one has been able to work out the absolute truth about things - which requires true knowledge of reality. We just have people's opinions which invariable lead to conflict, confusion and harm. So how can we work out what physical reality is, as the source of truth and wisdom? To begin we need to remove incorrect ideas that are leading us astray. This then leads us to the correct foundations for describing reality as the source of absolute truth. I will start with a nice experiment that you will hopefully relate to! Idealist philosophy believes that the mind exists, and that our sense of the external world (physical reality) is simply a construction of the mind. Given that all our knowledge is in fact a creation of the mind (imagination) it has been difficult to refute this - to get from our ideas of things to the real thing in itself (see Kant). The experiment. Imagine an idealist philosopher in an airplane at 30,000 feet. A ten second timer is activated that will eject the 'philosopher' from the plane. They are wearing a parachute, but it is not fastened. They must decide if they wish to fasten themselves to the parachute or not. This eliminates idealist philosophers / philosophy- they either fasten the parachute and thus acknowledge the truth of physical reality - or they do not and fall to their death! This argument is a bit mischievous, but it does make two important points - that the physical laws of Nature apply equally to humans as they do to all other matter - and while it is easy to be an idealist when writing essays, we should always apply these ideas to physical reality (the ultimate determiner of truth!). I recently read a philosophy joke that summarizes this problem of postmodern philosophy very well! While I admit this does make me smile, the truth is that this confusion and contradiction in philosophy (that all is opinion!) does great damage to what is in fact a most beautiful and important subject. This is not trivial as the problems of philosophy always manifest as problems for Humanity, and this largely explains why our modern world suffers such profound problems (the destruction of Nature and resultant change in the Earth's climate and ability to produce clean air, water, and food - which are clearly necessary for our future survival). Again it is worth quoting Karl Popper. We now need to make one important clarification about truth - which will then lead us to our solution. One billion years ago the earth orbited the sun - thus there was a necessary connection between the earth and sun. Yet at that time, before our human evolution, there were no truths. Just physical reality abiding by its laws. This is very important to realise, as libraries full of books have been written about truth - yet it is really just a concept that we make up (humans like to create things!). In reality there is just necessary connection - this is the source of truth. So for any statement you can always analyse it in terms of necessary connection. Here are two simple examples of logical and empirical 'truths' that found science. Logical Truth: We can create necessary connections through definitions / principles, e.g. 1+1 = 2 and 1+1+1= 3 thus 1+2 = 3 is true because of the necessary connections we created. This relates to the axiomatic foundations of mathematics and principles in theoretical physics which are necessary foundations to deduce things from. Logical truths are a priori (necessary, certain and universal - anyone would deduce the same results). Empirical Truth: "The current time on my computer is 5.30am" is true if there is a necessary connection between my eyes and the light emitted from my computer showing this time. Empirical truths are a posteriori (uncertain, dependent on senses which can deceive us). Summary: To know the truth about things we need to know how they are necessarily connected. Thus to know the truth about physical reality we need to know how matter exists and moves about in space in a necessarily connected way. If we knew this then we would find that deductions from our theory of reality (logical truths) would match knowledge from our senses / experiments (empirical truths). Popper's problem of induction is no different than Hume's problem of causation and necessary connection - they are the same problem because 'necessary connection' is the central problem of knowledge which applies to all the sciences - physics, philosophy, metaphysics, theology. Popper claims that we can never prove something is true, we can only show that it is false. So we could drop 10,000 idealist philosophers out of the plane, one after another, yet we could never be certain that the next one would fall to their death. To do so we have to assume the future is like the past - and this is uncertain. This is the current state of science / physics, which is founded on induction from empirical facts (uncertain) rather than logical deduction from principles which correctly describe reality (certain). Hume is saying that once we know the causal connection between things, we could deduce with certainty the effects, and they would always match the effects we in fact see, i.e. logical truths = empirical truths. And Popper acknowledged the truth of this. (It seems though that postmodern philosophy has forgotten this fact in their haste to say that we cannot know the absolute truth about physical reality). This confusion is clearly evident in modern Physics, e.g. the particle / wave duality of both light and matter, the big bang origin of the universe from no space and time. However, we can now show that this confusion is simply due to errors in the foundations of physics relating to the discrete and separate particle conception of matter. i.e. If you try to explain reality in terms of many things (like many separate 'particles' moving around in space and time) then you still lack knowledge of how they are necessarily interconnected (so they add 'fields' or more 'particles' to connect them - but it is a naive way to solve the problem and it clearly cannot work). What is the most simple science theory of reality? With a little thought you will realise this is the same as asking what is the necessary connection between things - as there must be one thing that causes and connects the many things - and this is necessarily the most simple solution. Of profound importance is the fact that there is only one solution (which is deduced). The Wave Structure of Matter in Space - where Space exists with the properties of a wave medium and matter is formed from spherical standing waves in space. Note: We have a page of wave diagrams that will help you visualise the spherical standing wave structure of matter (WSM) in space. Basically, we only see the high wave amplitude wave-center and have been deluded into thinking matter was made of tiny little 'particles'. A very naive conception in hindsight - and quantum physics was telling us all along that waves were central to light and matter interactions! From this foundation you can then show without any opinions that the theory works, i.e. it correctly deduces fundamentals of modern physics. See: Quantum Physics, Albert Einstein's Theory of Relativity, Cosmology. Immanuel Kant is the most famous metaphysicist of western philosophy, and there is no doubt that his 'Critique of Pure Reason' is the most comprehensive analysis of Metaphysics since Aristotle's pioneering work which founded this subject. Thus no essay on philosophy would be complete without an explanation of Kant' synthetic a priori knowledge. The solution is simple and obvious once known. Kant made one small and yet fundamental mistake. And this error led to the belief that we could never know reality (the thing in itself), only our ideas of reality which were necessarily incomplete. Kant is correct that Space is a priori, or first necessary for us to have senses (which are a posteriori). The solution to Kant's error is to realise that the exact opposite is true, that Space considered in itself contains wave motions, i.e. Space physically exists as a substance with the properties of a wave medium and contains wave motions that form matter and cause the effect of time. Kant's error is understandable in hindsight, because he followed Newton, and was conditioned into thinking that motion applied to matter 'particles' in space and time. Thus 'empty space' had no 'particles' - so motion could not exist in 'empty space'. Once we replace the particle conception of matter in space and time with the wave structure of matter in space then we can easily see the error and how it is solved. Thus the two pure forms of sensible intuition, as principles of knowledge a priori, are namely Space and (wave) Motion. We must place in this a priori concept of Space the correct meaning - that Space is a wave-medium and contains within it a second thing, wave motions of space that form matter (i.e. synthetic a priori knowledge - we must correctly define the properties of space which is a creative act, a synthesis of space and its wave motions that form matter). In ending, we now know why our Idealist philosophers fell to their death. Because matter is a structure of the universe, necessarily interconnected to all other matter around us by the spherical wave motions of Space that cause the 'particle' effect of matter at the wave center. Further study of physics then shows us that one property of space is that the waves travel more slowly where there is more matter waves (equivalent to higher energy density of space in Einstein's general relativity). This causes the philosopher's wave center 'particles' to re-position towards the earth (and this same causal connection of waves causes light to curve past the sun). So now you know what gravity really is - because you know what physical reality is and thus how material things are necessarily connected in Space by their spherical in and out waves. Please see links on the side of this page for the main articles which explain and solve the central problems of postmodern Metaphysics, Physics and Philosophy from the new foundation of the Wave Structure of Matter (WSM) in Space. And the Philosophy Site Map lists all philosophy pages. I hope that you enjoy browsing around! And I really hope you will think about this - it seems self evidently true to me, thus the most important knowledge that we shall ever discover. To finally understand what we really are as humans (amazingly large wave structures of the universe) as the true foundation for thinking and acting wisely in a world that is now in great need of wisdom from truth and reality.